First things first, Wish u all a very happy and a prosperous ,joyous New Year. To start this year's post am here with a pasta recipe lil different from the usual. Yes, no sweets /desserts /cake this time. Sure, I wanted to , but my H and my baby are not in a mood to allow me . Somehow, I should find some time and bake some cake since it's been a decade I've baked something and am craving like anything nowadays. This pasta is such a simple and a classy dish and the most important thing is kids would love it as it doesn't involve any spicy items ,only if u add to make it spicy, a delicious dish that would surely fill ur tummy in no seconds..
Garlic clove -- 1 no. Cook the pasta until al dente with enough water added with oil and salt . Might take 7 minutes to reach the stage . drain the pasta and clean with cool / fresh tap water and set aside. Clean the cilantro and pick the leaves . MAke sure u retain the tender stalks as well. Dump the cilantro with stalks into the processor / mixie jar, followed by garlic clove,cheese,nuts,pepper powder, green chilly and give it a whip. Finally add the oil and grind to a fine paste. 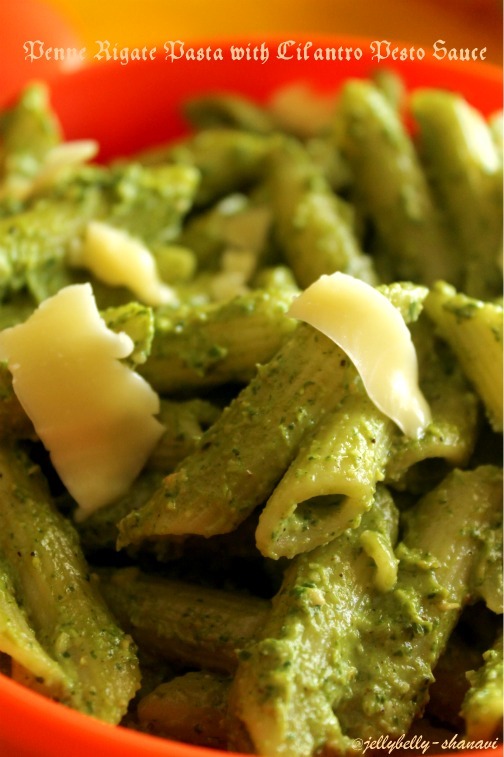 U may store this pesto sauce for the next 3 to 4 days if u properly sealed and stored in the refrigerator. Coming to the recipe, heat a skillet with a tsp of olive oil and add the pesto sauce (all at once, if u like a generous coating of pesto in pasta. Actually, the measurement I've given is good enough only for 2 servings, so u might wanna add everything).Whip the sauce for few secs and dump in the cooked pasta and mix well for 1 or 2 minutes. Serve the pasta with the remaining grated cheese on top and njoy eating hot !!!! Green chilly is optional and I've added one to make it lil spicy rather bland. Double the ingredients of the pesto sauce to store for further use. 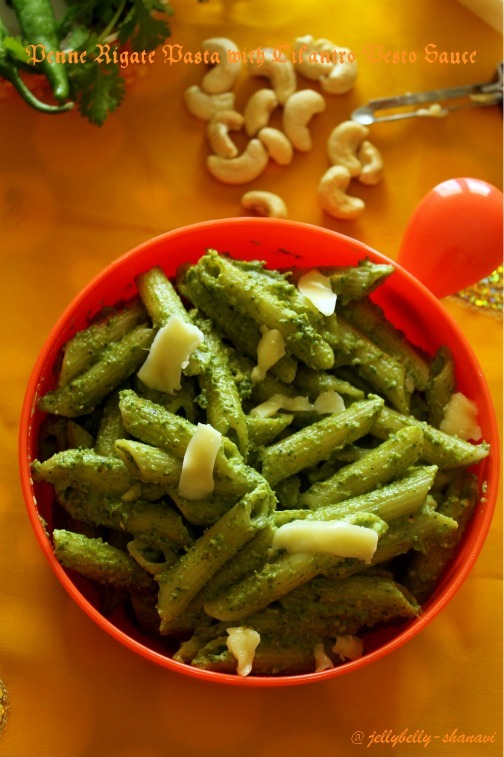 Pine nuts is added in general to make pesto. But all I had was cashews n badhams. Addition of cashews definitely makes this dish rich, tasty and heavy.. All in all I loved it to the core. U may also reduce the cheese if u want to. U may cut down the garnishing part and eat as such. 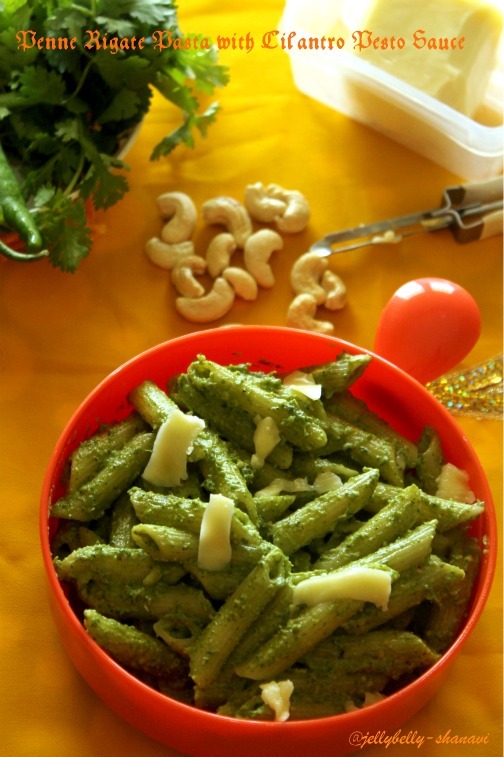 Delicious and tempting pasta..nice recipe..
Yummy and colourful. Perfectly done. 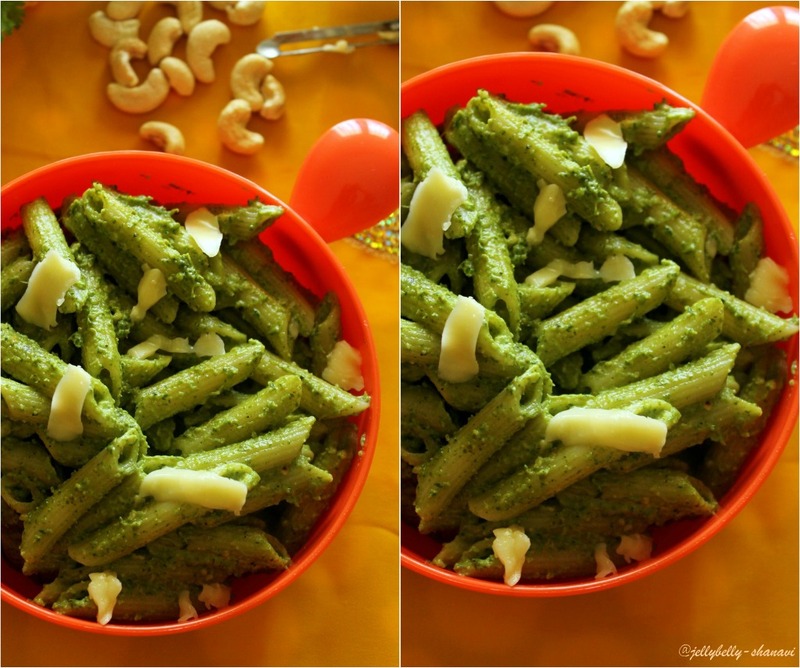 Pasta looks simply stunning and the pics are wonderful. New dish to me !! looks so inviting and delicious !! Wishing you and family a happy and prosperous New year. 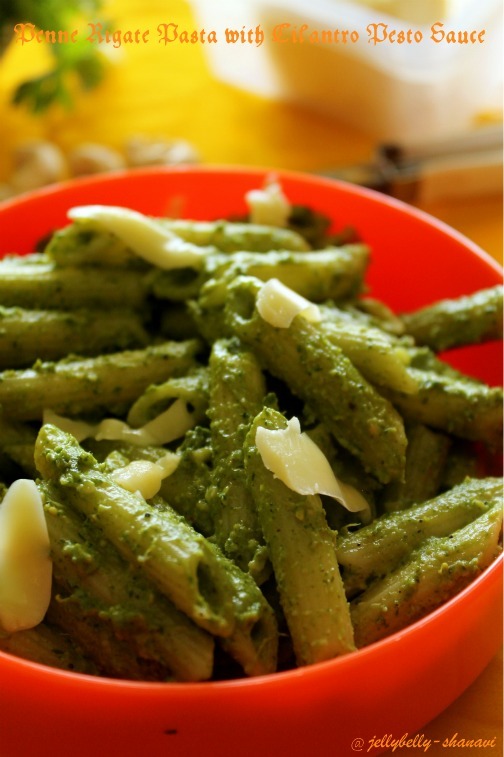 Pasta with cilantro pesto looks delicious. பச்சை கலரில் பாஸ்தா பார்க்கவே அருமையா இருக்கு!! Lovely color and flavor to the pasta Happy 2012 Shanavi. Pasta looks very nice and very inviting. 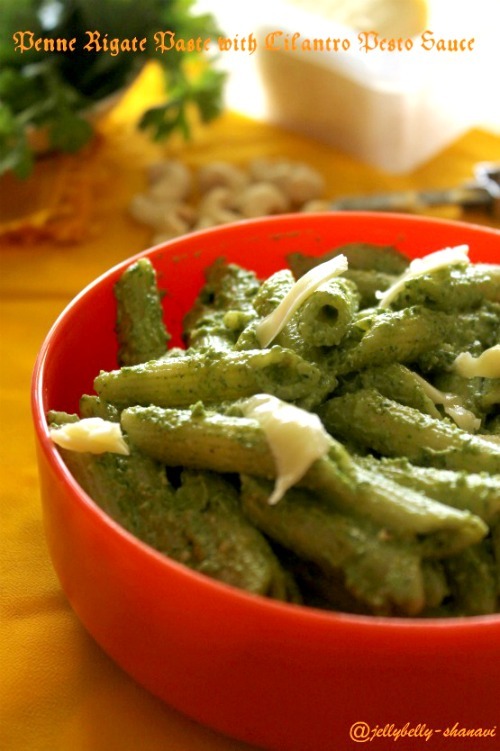 wooooooooooooow....you never fail me to impress with your lipsmacking dishes...love this tempting recipe..
Lovely pasta Shobana...the sauce is very nice..love the colour...have a wonderful year ahead!